Starting lineup changes: 17 WR Davante Adams will start in place of Cobb, 82 TE Richard Rodgers will start in place of Cook, 34 RB Don Jackson will start in place of Starks, 56 LB Julius Peppers will start in place of Matthews, 39 CB Demetri Goodson will start in place of Randall and 36 CB LaDarius Gunter will start in place of Rollins. As per team tradition, the Packers select game captains each week. Today’s captains will be T Bryan Bulaga (offense), DB Micah Hyde (defense) and CB Demetri Goodson (special teams). – If you’re looking for a Packers bar airing the game, try the search feature on Packers Everywhere. – FOX Sports, now in its 23rd season as an NFL network television partner, will broadcast the game to the majority of the country. – Play-by-play man Thom Brennaman joins color commentator Troy Aikman and sideline reporter Erin Andrews. – Milwaukee’s WTMJ (620 AM), airing Green Bay games since November 1929, heads up the Packers Radio Network that is made up of 50 stations in five states. Wayne Larrivee (play-by-play) and two-time Packers Pro Bowler Larry McCarren (analyst) call the action. – Sports USA Radio will air the game on radio across the country. John Ahlers (play-by-play) and Charles Arbuckle (analyst) will call the action. – The broadcast is also available on Sirius Satellite Radio (WTMJ feed). – DIRECTV subscribers can watch the game on Channel 709. – NFL Game Pass gives fans access to full replays of every NFL game on demand, in high definition. 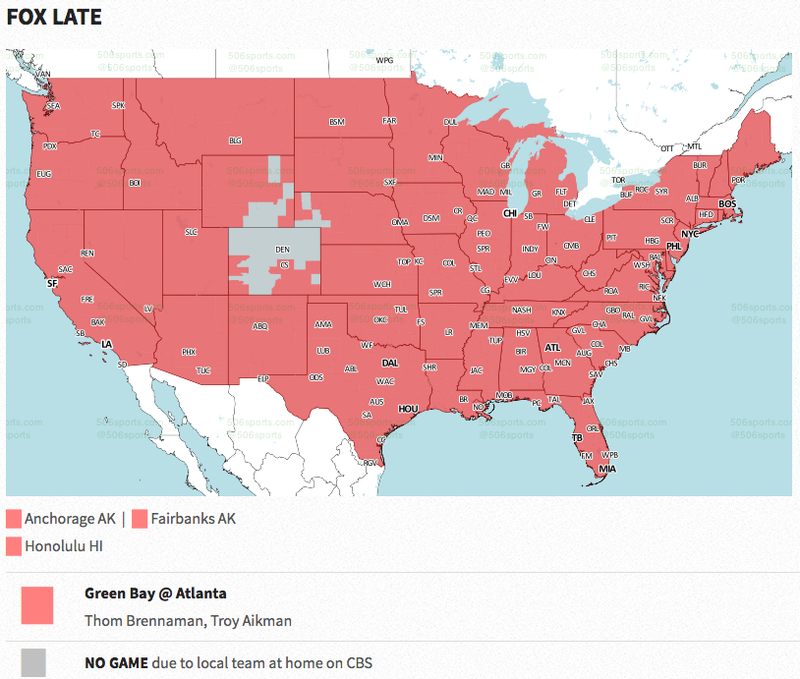 TV map is courtesy of 506sports.com. View the full image.